To Download just click on the image below and save the file. A lot of work has gone into the preparation of this book, which is offered Free of Charge. If you would like to make a donation to the Pollokshaws Heritage Group to support this Website and its continual development, this would be much appreciated. 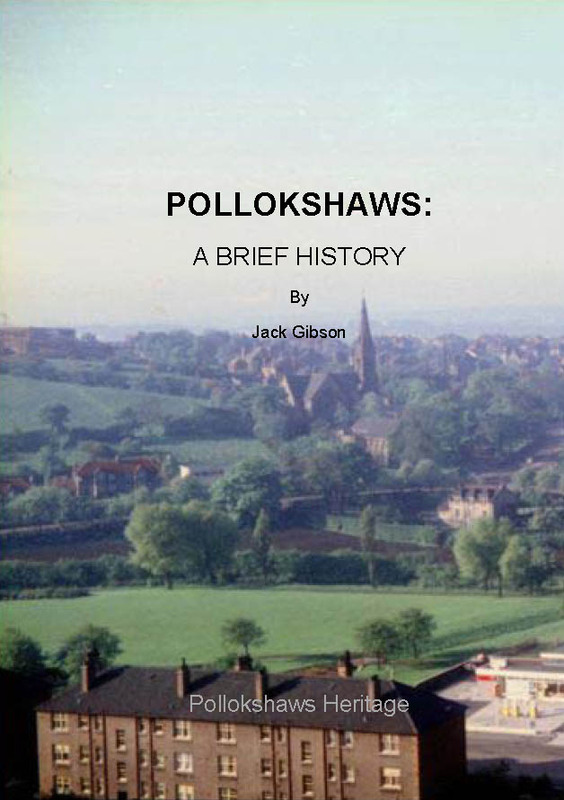 Pollokshaws has a long recorded history dating from before the year 600 AD. A monk named Conval, son of an Irish prince, left Ireland, his native country and according to legend crossed the sea standing on a slab of stone, and stepped ashore at Inchinnan on the Clyde. The meaning here may be that the stone was of some significance to the Celts, or was simply being carried in some kind of craft as ballast. Two stones reputed to be connected with this event can be seen lying in a small railed enclosure near the Normandy Hotel in Inchinnan Road, Renfrew. From there Conval joined St. Kentigern (or St. Mungo as he is better known), and was directed by him to preach the Christian faith to the pagan people in the wooded area to the south east of Paisley, a region now known as Eastwood. Here, beside a spring of clear water, he built his little wattle-and-daub church in what is now Eastwood Old Cemetery and commenced his work of bringing Christianity to the district. The church was no more than a small hut used by Conval for his own devotions, and he preached to the people in the open air. As time passed he gathered round him a number of converts who, as monks who lived in other huts nearby, formed a group which in the course of time became a small village named Kirkton. This village existed in various forms until industrial development nearby from the middle of the 18th century caused the spring to dry up. Conval was canonised later, becoming St. Conval, and is believed to have died on the 18th of May 612. The next significant event in the development of Eastwood came around the middle of the 14th Century. Descendants of a Saxon Nobleman named Maccus, who had previously settled in an area that became known as Maccuswell near Dumfries in the 12th century, acquired land in the Eastwood district. In time the family name became Maxwell, and branches were established around West Central Scotland. One of these, the Maxwells of Nether (lower) Pollok, were given a charter for their lands in 1494, and Haggs Castle, thought to be the third building belonging to the family in the area, was built by a Sir John Maxwell during the years leading up to 1585. Through the centuries the Maxwells were benevolent benefactors of the people of Pollokshaws, and it is significant that the first mention of Pollokshaws should be in a document concerning members of the family. It occurs in a Papal Bull (a proclamation by the Pope) issued in 1536, and the story behind it is that some years before, a Laird of Pollok had three sons, the eldest of whom was to succeed him. The first son's marriage produced a daughter who was the heiress of Pollok. When the second son married, his father gave him the lands of Cowglen that had been purchased from the Earl of Lennox in 1518. This marriage produced a son and the two, the heiress of Pollok and the heir of Cowglen wished to marry, but as they were first cousins the consanguinity laws of the church did not allow this. However, it was possible to overcome the barrier by applying to the Pope for a special dispensation. The Laird's third son had entered the church and became Bishop of Orkney, and he was persuaded to apply to the Pope for the dispensation. Permission was granted for the marriage in a Papal Bull of the time, which also referred to Pollokshaws and its meal mill. At this time, under Scots Law each Laird had to erect and maintain a mill for the use of his tenants, and it is evident that from then on there was such a mill and that Pollokshaws was well established.